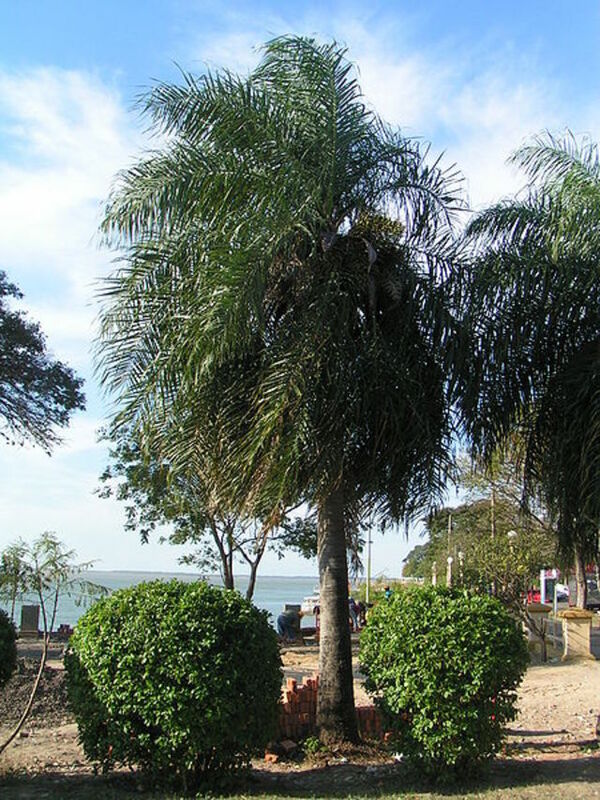 Is a species of palm native to tropical regions of the Americas, from southern Mexico and the Caribbean south to Paraguay and northern Argentina. It grows to 15-20 m tall, with a trunk up to 50 cm diameter, characterized by numerous slender, black, viciously sharp 10 cm long spines jutting out from the trunk. The leaves are pinnate, 3-4 m long, with numerous slender, 50-100 cm long leaflets. Petioles of the leaves are also covered with spines. The flowers are small, produced on a large branched inflorescence 1.5 m long. The fruit is a yellowish-green drupe 2.5-5 cm in diameter, containing a single, dark brown, nut-like seed 2.5-5 cm diameter, which is very tough to break. The inside is a dry white filling that has a vaguely sweet taste when eaten. Yes it is! Its an acquired taste to enjoy the sweet (by my taste buds anyway) sticky yellow pith fruit that covers the stone. The nut lies within the stone and it is indeed edible, but has only mild taste. No this is not gru gru. This has a larger and harder nut.